If you like crackers, Triscuits (or whole wheat baked snack crackers) are for you. They are salty and crunchy and great alternative to the higher fat alternatives such as potato chips or Doritos. There are lots of different brands of "Triscuit" like crackers -most of them taste the same. Look for ones that contain the fewest ingredients. They really should only contain wheat, oil and salt. It is easy to figure out how many calories you are eating with Triscuits. 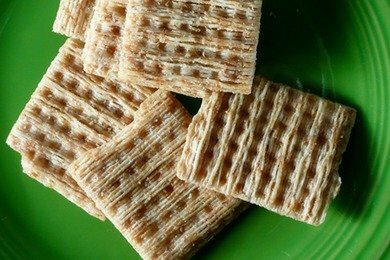 10 crackers equal under 100 calories. So, buy a big box and then portion them into bags to take with you. Resist the urge to eat Triscuits out of the box because it is REALLY hard to keep track of how many you have eaten. HAVE BEEM EATING NABISCO TRISCUIT ROASTED GARLIC CRACKERS FOR SOME TIME NOW. I FIND THESE CRACKERS VERY TASTY, I HAVE READ THE LABEL AND CONSIDER THESE CRACKERS TO BE "HEART HEALTHY".WOULD YOU AGREE? IF YOU DO NOT AGREE PLEASE STATE YOUR REASONS. I started purchasing and serving Triscuits when my daughter was 2 years of age. She'll be 33 this year and serves Triscuits to her family. Triscuits are absolutely my 'very' favorite cracker and I love the new flavors! I have never found Triscuit that are 100 calories for 10 Triscuits??? Every box I look at has 120 calories for serving size of 6 Triscuits. This is why I don't buy them...too many calories. Are there miniature ones out there I dont know about? I'm with engima, I just checked my box and 6 "Woven Squares" (Great Value, Walmart) = 120 calories. That's still better than most snacks and I love them. Especially with a good fat free dip or salsa.